Jackie Stewart, overweight and tired of it, decided enough was enough. Mrs Stewart joined the fitness camp "Fitness camp academy" in South Shields, England. "I joined Fitness camp academy at South shields because it was on my way home from work so I knew I would attend 3 times per week." Jackie weighed in at around 70 kg (approx. 11 stone) and had a waist approximately 41 inches. Joining a fitness camp can be a daunting task as embarrassment can get the best of you, Jackie overcame this fear and it was then that she was able to find other people of all sizes that were trying to accomplish a similar weight-loss goal, people that were determined to change their lives. "We did not compete against each other, but against ourselves. When I began my first squat, I fell over, but no one laughed at me, they helped me up." For the first few weeks of exercise, there was no apparent difference, but then she found herself with baggy clothes; her clothes were just too big and she felt fitter. Mrs Stewart continued her regular routine at the fitness camp, and for the first time in 39 years, she decided to give up smoking. "I stopped smoking after 39 years and the weight began to diminish" she said. After just 4 months, Jackie, at 5.3 feet (approx. 162.5cm) and aged 50, weighed an amazing 57 kg (approx. 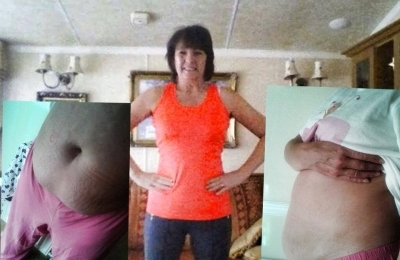 9 stone) and has not touched a cigarette since she quit. Jackie has stated that it is all thanks to the FCA (Fitness camp academy) which she has called a "fantastic family". Finding the inspiration to get into shape and lose weight can be difficult; Jackie found her inspiration through the determination of everyone else in the fitness camp. She has found it very rewarding and lots of fun. So if you are out of shape and need some of your own inspiration, you can think of Jackie and her fitness mission.